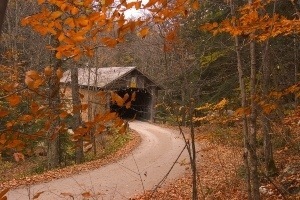 Sadly I have never been to New England but apparently covered bridges are ten a penny. Some have roads through them and some are narrower for walking or cycling. They first appeared in New England during the 19th century and it seems nobody quite knows why they are covered. One idea is that the cover helps to protect the bridges from the ravages of the New England weather and another is that, as they tend to look like barns, animals are happier to cross rivers by going through them. Either way, they are very picturesque especially during ‘The Fall’. This particular signed print (top) numbered 36/200, is by Jean Tallman. 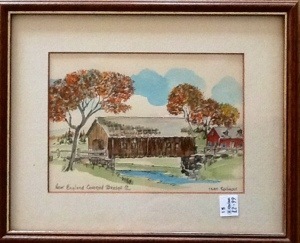 According to the Bedford Historical Society, Jean is a well known local artist in Bedford, New Hampshire. Indeed, it is possible to view a number of her works on line and on auction websites. This is a charming print (possibly finding its way to England after a holiday in New England) and worth every penny of the £2.99 that was paid for it.